Queenwood is an internationally-minded girls’ school that offers a contemporary liberal education. Our purpose is to develop in students the intellectual rigour, independence, character and skills to contribute sustainably to the world. Founded in 1925, Queenwood is a K-12 school in a location of exceptional natural beauty in Balmoral. 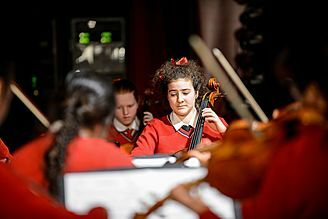 Our learning community is small enough for each girl to be known as an individual, and large enough to support the full range of academic and co-curricular programs. We offer a liberal education because of our commitment to the life of the mind beyond the bounds of externally imposed curricula, and because we believe that a disciplined and independent mind best equips our young women to deal with complexity, diversity and change. The School’s motto is Per Aspera ad Astra, Through Struggles to the Stars, and reflects our commitment to developing young women of character, generous in spirit and motivated to apply their gifts and energies in the service of others. The Diploma Programme has been offered at Queenwood for over a decade with a wide variety of subjects on offer, and our students have a strong and consistent record of high achievement. Our students are more than their grades, however, and we value each girl for who she is, and the person she has the potential to become. Diploma Subjects Offered – Group 1: English A Literature HL and SL, English A Language and Literature HL and SL. Group 2: French B HL and SL, German B HL and SL, Japanese B HL and SL, Spanish ab initio SL, Latin HL and SL. Group 3: Geography HL and SL, Economics HL and SL, History HL and SL, Environmental Systems and Societies SL* (*Interdisciplinary Group 3/4). Group 4: Physics HL and SL, Chemistry HL and SL, Biology HL and SL, Environmental Systems and Societies SL*. Group 5: Mathematics HL, Mathematics SL, Mathematical Studies SL. Group 6: Visual Arts HL and SL, Music HL and SL.